Background/aims To identify ocular phenotypes in patients with geographic atrophy secondary to age-related macular degeneration (GA) using a data-driven cluster analysis. Methods This was a retrospective analysis of data from a prospective, natural history study of patients with GA who were followed for ≥6 months. 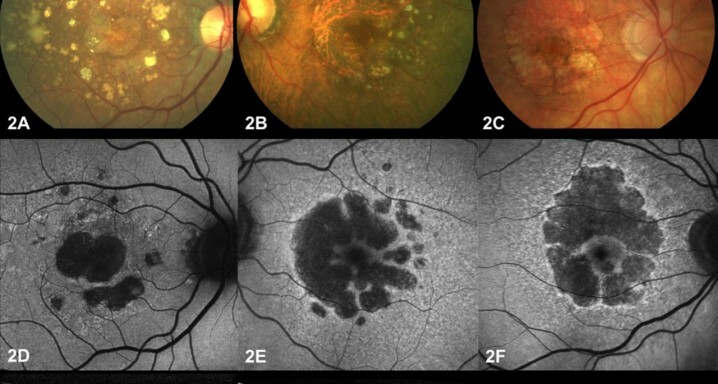 Cluster analysis was used to identify subgroups within the population based on the presence of several phenotypic features: soft drusen, reticular pseudodrusen (RPD), primary foveal atrophy, increased fundus autofluorescence (FAF), greyish FAF appearance and subfoveal choroidal thickness (SFCT). A comparison of features between the subgroups was conducted, and a qualitative description of the new phenotypes was proposed. The atrophy growth rate between phenotypes was then compared. Results Data were analysed from 77 eyes of 77 patients with GA. Cluster analysis identified three groups: phenotype 1 was characterised by high soft drusen load, foveal atrophy and slow growth; phenotype 3 showed high RPD load, extrafoveal and greyish FAF appearance and thin SFCT; the characteristics of phenotype 2 were midway between phenotypes 1 and 3. Phenotypes differed in all measured features (p≤0.013), with decreases in the presence of soft drusen, foveal atrophy and SFCT seen from phenotypes 1 to 3 and corresponding increases in high RPD load, high FAF and greyish FAF appearance. Atrophy growth rate differed between phenotypes 1, 2 and 3 (0.63, 1.91 and 1.73 mm2/year, respectively, p=0.0005). Conclusion Cluster analysis identified three distinct phenotypes in GA. One of them showed a particularly slow growth pattern.